AKA: あんハピ♪ ; Anhapi; Unhappy Go Lucky! Distributor: Licensed for streaming on crunchyroll. Also Recommended: Non Non Biyori, Hidamari Sketch. Notes: Based on the manga by Cotoji, serialized in Houbunsha's Manga Time Kirara Forward. The manga has been licensed by Yen Press. At Tennomifune Academy, there's a special class, Class 7, for "unlucky" students. Anne Happy features 3 (or 5) of the seemingly unluckiest students of all, who keep discovering that no matter what fate throws at them, it's fine because they have each other. I've been slow to do this review, for a reason: really good shows motivate me to paens of praise; really bad shows motivate me to mountains of scorn (which is catharsis for the critic, and can be entertaining for the reader, who fortunately didn't have to actually SEE the show); but just-mediocre shows don't motivate me to write at all. So this was a bit of a chore, but it's my duty. I usually start with the characters, who are, as might be expected from the above, singularly boring, or at least boring most of the time. Our actual chief heroine here is Ruri Hibarigaoka (always called "Hibari" in the show.) In one episode she says she always "messes things up", and yet we never really see that in the series except in the one incident that immediately precipitates this comment. In other words, except for the plot of this one episode, it's not really been a recurring theme of the show at all. The only consistent theme with Hibari is her one idiosyncrasy, which (I THINK) is meant to be amusing: she's in love with the hardhat character depicted on construction-site signs. And THAT's as quirky as the show will allow her to be. That's our "three" girls who become close friends. 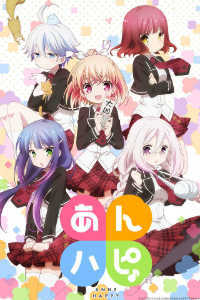 To get to "five" we have to include two more who think of themselves as not especially close to the trio, but nevertheless usually find their paths crossing the trio's, and tending to share the same fate (for good and ill.) One is Hibiki Hagu, who refuses to think of herself as being a "loser" like the trio's members. Her most marked tendencies are a tendency to get easily lost, and a yuri thing for her childhood friend Ren Ekoda. Ren is of that species of silver-haired anime girls who don't express much emotion at all, though she does seem to have subtle feelings toward Hibiki- though it seems more maternal ones than romantic ones, as far as I could tell. Besides being phlegmatic, Ren also attracts animals, though just female ones, and unlike Hanako the animals she attracts actually LIKE (and protect) her. I was never clear why Ren was considered unlucky, except to the extent that Hibiki's luck sloughs off on her. I should probably describe Tennomifune Academy in greater detail, even though it's so implausible it makes Hogwarts seem as likely as Harvard, and so silly that it aces Monty Python's Camelot in that department. (Some dancing on tables would have actually HELPED here, however.) The basement of the school contains a giant casino as well as a VR facility that would put the Enterprise's holodeck to shame. In the latter, we are treated (maybe punished?) by skits in which the girls are first sword-and-sorcery warriors, and then magical girls, up against Ms. Kodaira, who (except in one episode) seems to be their only teacher, and who seems to have a disturbingly sadistic side; when Ms. Kodaira actually opens her eyes, she transforms from amiable and good natured, into a kind of supervillain- all for the students' sake, I suppose, though it didn't always SEEM that way. Somehow none of this is as interesting as it sounds. I can't explain why, that's just the way it IS. And finally, there's Timothy. Yuck. Timothy is a robot, in the shape of a poorly-drawn rabbit; he's the kind of sidekick/mascot character that's just trying too hard (You know what I mean), and makes you wish that Elmer Fudd would show up, on one of those rare days when Elmer's aim was true. When we are inundated with a host of mini-Timothys late in the show, unlike the girls, I did NOT find it cute at all; looked more like the Apocalypse to me- IF the Apocalypse could be pictured as a ho-hum event. I bet this show could pull that off. Recommended Audience: Light fanservice. There are locker-room and swimsuit scenes. Should be fine even for 13 year olds IF they're incredibly patient.